Mixing Metals - Yay or Nay? I’ve been a full time designer for just two years now so I am definitely still finding my style and learning what my likes and dislikes are. When I first started working in the field, I listened to what those around me said “never mix your metals.” Basically if you use stainless in one room, you must use it throughout that space and/ or throughout the whole house; if you use bronze, you must do the same everywhere else. I stood by this rule for my first year or so until recently. I started to realize that I actually love the look of mixed metals! I will say that my style is very eclectic so far. I seem to like aspects of all different types of designs so I think this is why I love the mixed metal look so much. I don’t like to be locked into just one color, texture, or theme. ​I love how the photo above mixes chrome with gold. I especially like how the gold brings some warmth to this overall cool space. 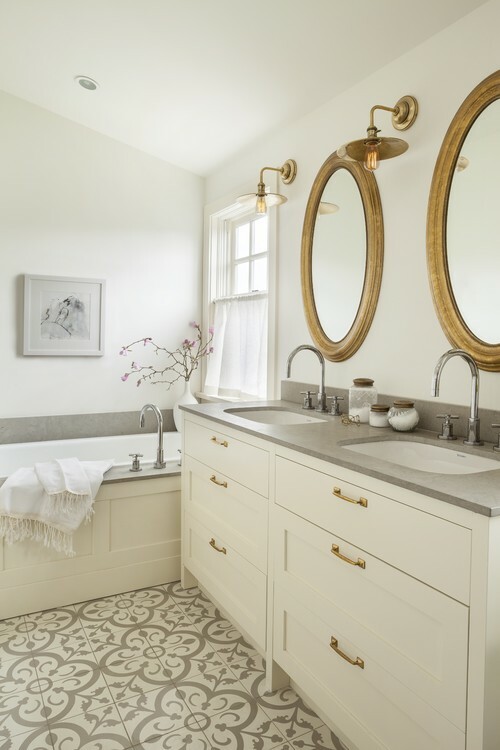 What makes this work for me is that the gold is repeated on the mirrors, cabinet hardware, and light fixtures while the chrome is only seen on the plumbing fixtures. It creates a nice balance. I think the key to mixing metals is doing it tastefully (one of my go-to sayings – anything can be done if done with taste!). You must choose wisely where you are going to change it up! I certainly think all of the plumbing in a room should match, but they don’t necessarily need to match the furnishing, lighting fixtures, cabinet hardware, or interior door hardware. 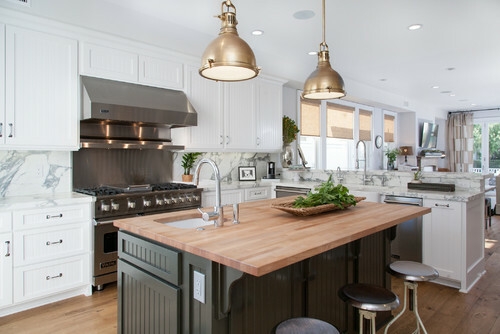 ​Above is another kitchen that mixes metals with class! I love how there is a direct pattern here – although I don’t necessarily think that there should always be this specific of a pattern. 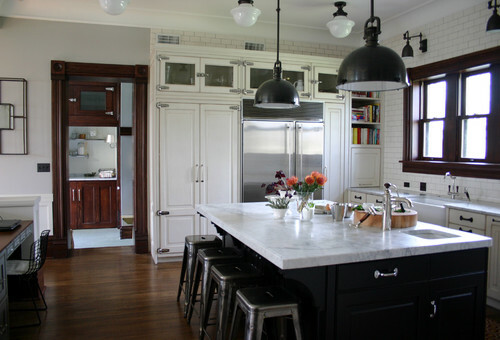 I am really loving black fixtures lately – whether it be plumbing, light fixtures, cabinet hardware - I love it all!! 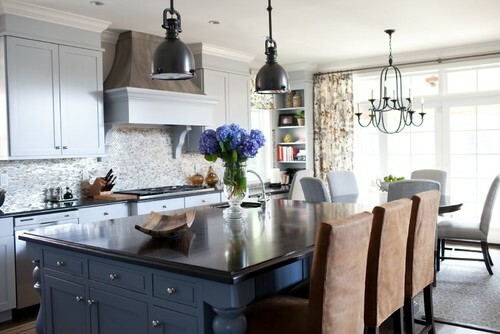 This photo has chrome on all of the plumbing and black on all of the light fixtures, but the cabinet hardware flip flops; the black cabinets feature chrome pulls while the white perimeter shows off a contrasting black pull. You will also notice that the cabinetry on the back wall switches back to chrome for the pulls and hinges. I think this was genius for the designer to do because black on those exposed hinges would have been very overwhelming. Even further, the stools at the island are a silver finish and the desk to the left has a black metal seat. 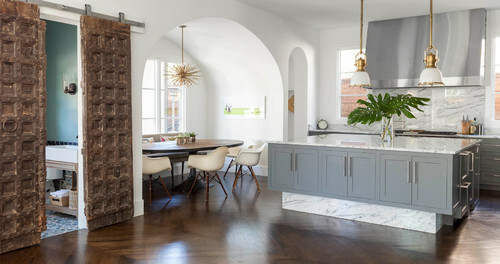 This kitchen incorporates different metals at every turn and I actually love it. 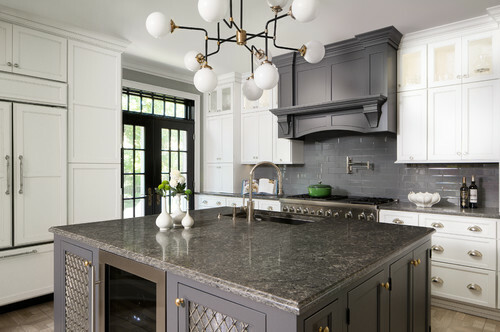 I digress – aside from the metals, I love the mix of black with deep brown and love how the subway tiles have a darker grout to help the backsplash to tie in with black accents as well!! *Click the photo and access more photos of this space. ​Black & Yellow, Black & Yellow… I have seen this bathroom I think 100 times, but every single time, I fall in love with it again. I love the eclectic mix of literally everything in this space! I love that the designer brought in wood tones with black (again) and that the subway tile has a dark grout (again) and, of course, that the plumbing is brass and every other metal in the room is black! 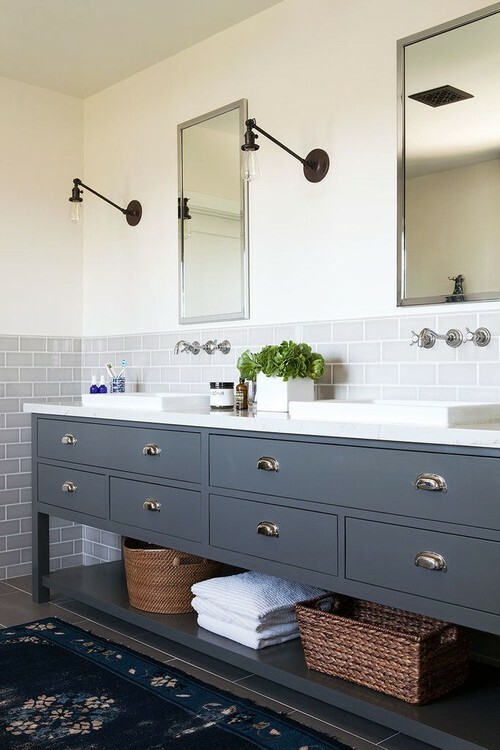 But wait – there are 2 different metals used on light fixtures in this wash room, but it looks so great. The sconces on the wall are black and you can see a tiny sliver of a brass chandelier on the ceiling that repeats the plumbing color. 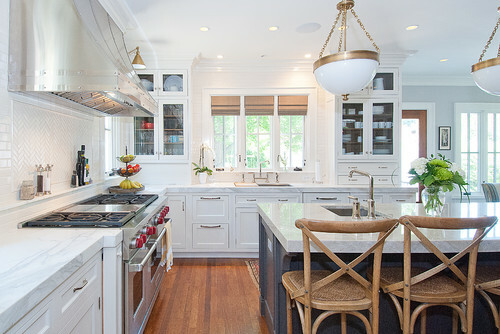 I love that this kitchen mixes 3 metals. The light fixture is black with gold accents while the plumbing is a stainless/ brushed nickel base. Brass is repeated on the island hardware while the perimeter switches back to nickel. The black accent door leading to the outside rounds this space out. See below for a few more examples of how mixing metals can offer an interesting twist to your space! I could say so many things about all of the images above, but this post would be far too long. I love all of these so I am voting "YAY" on the mixing of metals topic! I want to hear what you all think!! Yay or Nay?? Thank you for reading! Interior designer inspired by color, nature, and texture. I love sharing my projects with you. Please have a look around and keep in touch by subscribing.